Selected articles including lectures and presentations from the RUSI of NSW Journals are available online. Use the buttons below to see those available. United Service, is the Institute’s highly-respected professional journal. It is published quarterly – in March, June, September and December – both in hard copy and on-line [on this website and on RMIT Informit Collections at www.informit.com.au]. It was originally published annually as the Journal and Proceedings of the United Service Institution of New South Wales beginning in 1890, but publication was suspended during the two world wars. It has been published continuously in its current form since 1947. United Service seeks to inform the defence and security debate in Australia and to bring an Australian perspective to that debate internationally. United Service is aimed at a diverse readership drawn from the Australian Defence Force, the federal and state police, border protection and customs services, the intelligence community, the public service, academia, defence science and engineering, defence industry (including design, manufacturing, logistics and transport), the merchant marine, and the wider community. Given this breadth, United Service avoids the use of abbreviations, acronyms and jargon wherever practicable. United Service publishes papers presented at meetings and seminars organised by the Institute (‘Institute Proceedings’). Contributed papers dealing with defence and security issues or military history also will be published, together with relevant opinion pieces, letters to the editor, defence and security news, biographies, obituaries, book reviews, book notes and Institute news. The focus is on defence and security policy and its strategic and operational implementation, although material with a different scope (tactics, techniques, equipment and the like) will be considered where it contributes to the overall objective. The Editor is Dr David Leece, a former citizen soldier who commanded the 8th Australian Infantry Brigade Group from 1988 to 1990. In civil life, he was a research scientist and later a senior public administrator in the agriculture, natural resource and environment protection fields. He retired from full-time public administration in 2002, but, for several years thereafter, continued to provide policy advice to government on a part-time basis. He has had extensive experience as both an author of scientific papers and publisher of scientific journals. The editor is advised by a committee consisting of: Dr David Leece – chair; Dr Ian Pfennigwerth; Colonel Marcus Fielding; and Air Vice-Marshal Bob Treloar. Contributions are invited from readers, whether or not they are Institute members. Before acceptance, contributions are refereed, normally by the Editorial Advisory Committee, and edited. Papers normally should not exceed 3500 words and may be accompanied by one or two illustrations, and a brief biography and a head-and-shoulders photo of the author. Opinion pieces, biographies, obituaries and book reviews should not exceed 850 words, guest editorials 400 words and letters 200 words, although longer letters may be considered where the subject warrants. We also publish short book reviews (400 words), particularly of books that have been in our Library collection for some time to encourage use of them, and book notes (100 words) briefly describing books recently acquired by the Library. Contributions should conform to the style of similar contributions in recent issues of United Service. They should be typed single-spaced in Times New Roman 11-point, with the margins ‘justified’. It is the editor’s responsibility to put accepted papers into the appropriate form for submission to the typesetter; but authors can assist by conforming as far as possible to the notes for contributors below. Contributions should be addressed to the Editor either at office@rusinsw.org.au (preferred); or by post to the Institute’s offices: Royal United Services Institute for Defence and Security Studies, New South Wales, Locked Bag 18, Darlinghurst NSW 2010, Australia. For electronic submissions, text should be attached to the e-mail as a ‘Word’ file and illustrations as a separate .pdf or similar file. Submission of a paper to United Service implies the transfer of the copyright from the author to the Royal United Services Institute for Defence and Security Studies, New South Wales as the publisher. Submission also implies that the author has not published the material, nor submitted it for publication, elsewhere; unless previous publication is clearly stated and the first publisher has granted permission for the material to be re-published by United Service. The Institute claims copyright of the journal and its contents. The Copyright Act 1968 permits fair dealing for study, research, news, reporting, criticism and review. Selected passages may be reproduced for such purposes, provided acknowledgement of the source is included. Otherwise, articles published in this journal may not be reproduced, stored in a retrieval system, or transmitted in any form by electronic or mechanical means, photocopying or recording, either in whole or in part, without the written permission of the Editor. 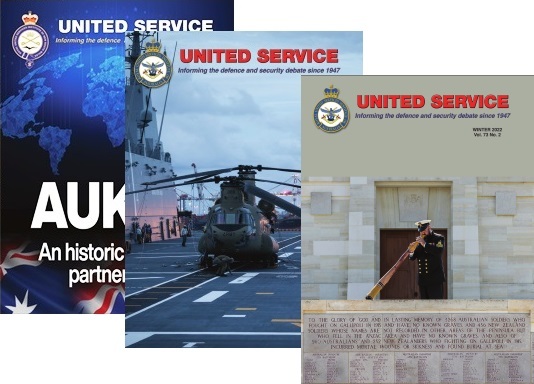 United Service is jointly published by the Royal United Services Institute of New South Wales, Incorporated, ABN 80 724 654 162, Locked Bag 18, Darlinghurst NSW 2010; and Pinnacle Publishing Pty. Ltd., ABN 90 153 935 874, P.O. Box 4192, Bay Village NSW 2261; T: (02) 4334 4711; F: (02) 4334 4433. United Service is printed and mailed to subscribers by Ligare Australia, 138 Bonds Road, Riverwood 2210, Phone: (02) 9584 7690. Institute members receive the journal in hard copy as part of their membership entitlement – there is no additional charge. The subscription for non-members is: in Australia $60 per year (post-paid); outside Australia AUD$70 (Asia-Pacific) or AUD$80 (elsewhere) per year (air mail); and can be arranged through the Business Manager at the Institute’s offices. E-copies of articles and e-subscriptions may be obtained through RMIT Informit Collections at www.informit.com.au. Advertising should be arranged through Pinnacle Publishing Pty. Ltd., ABN 90 153 935 874, P.O. Box 4192, Bay Village NSW 2261; T: (02) 4334 4711; F: (02) 4334 4433. Intending contributors should take the following points as a guide. •	tertiary headings should be in lower case (except for the first letter of the first word) bold italics. Headings are typed commencing flush with the left margin. There is one space above each heading, but no spaces below a heading. The text is typed in Times New Roman 11-point and ‘justified’, with the first word of each paragraph indented 0.6 cm. Any sub-paragraphs are indented 0.6 cm, including any that are denoted by dot points or numbers. United Service is published in English following contemporary international conventions. The Spell-check 'English (UK)' in 'Word' may be used as a guide. The spelling in recent editions of The Australian Concise Oxford Dictionary of Current English (Oxford University Press: Melbourne) is used to resolve any uncertainties. Latin and other foreign words and abbreviations, such as "inter alia" (meaning "among other things"), are placed in italics – thus: inter alia, viz., e.g., etc., matériel. Also placed in italics are the proper names of books and journals (e.g. United Service) and the names of ships (e.g. HMAS Sydney). Footnotes are preferred to endnotes. They may be used where relevant to provide additions to detail, but should be avoided wherever possible. Text footnotes should be indicated by superscript numbers and table footnotes by superscript letters. Text footnotes should appear at the bottom of the page where they occur. Table footnotes should be shown immediately beneath the table. If only one or two references are cited in a paper, these may be included as footnotes. Otherwise, literature cited in the text should be referenced at the point of citation by the author-date-page number system, e.g. •	(Brown 2005, 23-27) – where the material is cited in a book on pages 23 to 27. Royal New South Wales Regiment 27 (3), 1 – 9. Tables are numbered consecutively in Roman numerals. A title in lower case, except for the first letter of the first word, is placed above the table. Otherwise, the table is drawn using the ‘Table’ facility in ‘Word’. Horizontal divisions within the table may be shown, but vertical divisions normally are not shown. Tables are placed consecutively at the end of the paper and the place in the text where they are to appear is indicated thus: "[PLACE TABLE X NEAR HERE]". Photographs, maps, diagrams and charts should be provided as separate, stand-alone documents. They are numbered consecutively in Roman numerals. A caption, in lower case, except for the first letter of the first word, is placed below the figure. Where the copyright for the figure is held by another party, permission to reproduce it must be obtained before submission to United Service and credit must be correctly attributed at the end of the caption e.g. (Photo: Department of Defence). The place in the text where the figure is to appear is indicated thus: "[PLACE FIGURE X NEAR HERE]". Opinion pieces, biographies, obituaries and book reviews should not exceed 850 words and letters 200 words, although longer letters may be considered where the subject warrants. We also publish short book reviews (400 words), particularly of books that have been in our Library collection for some time to encourage use of them; and book notes (100 words) briefly describing books recently acquired by the Library. These contributions should conform to the style of similar contributions in recent issues of United Service and the guide for major papers (above) as applicable. A book review written for United Service should not exceed 400 words (short reviews) or 850 words (long reviews). The opening paragraph should be designed to capture the reader’s attention and should briefly state what the book is about – its key focus, e.g. naval strategy in the Pacific during World War II. The second paragraph should give a brief background of the author and his/her suitability or qualifications for writing this book. Subsequent paragraphs should elaborate the book’s main content. •	If the author presents a specific theme, thesis or position in the book, that theme should be clearly presented. •	It may be appropriate to comment on the nature, quality and extent of the research undertaken by the author to underpin his/her thesis. •	If the reviewer has an opinion on the author, contents or presentation of the book, it is appropriate to state that opinion. If the author takes a controversial position on a matter, this may be critically examined. •	It may be helpful to a potential reader to summarise the book’s structure and content. In the penultimate paragraph(s), it may be appropriate to comment on the presence or absence or quality of the index, references, bibliography, maps, photographs, diagrams or similar inclusions. It also may be appropriate to comment on the style in which the prose is written, e.g. a book may be criticised as being written in a dull or overly-journalistic style. The concluding paragraph should summarise the reviewer’s overall assessment of the book, e.g. this book provides new insight into the topic, or is one of the best I have read on the topic. The concluding paragraph should also include a recommendation about the people to whom the book might appeal – general readers, Australian Defence Force personnel, veterans, students, historians, etc. The review should be submitted as a 'Word' file. The content should conform to the style of similar book reviews in recent issues of United Service and the guide for major papers (above) as applicable. For recently published books, the review should be accompanied by a scanned photo of the cover as a separate .pdf file. •	Ursula Davidson Library call number (for books that are in the library only). The role of a referee is to advise the editors as to whether a contributed paper should be accepted for publication or be rejected. It is not the referee’s responsibility to edit the paper, although guidance to the editors as to where an overly-long paper may be shortened may be helpful. Before acceptance, a paper must satisfy four criteria: relevance, newness, soundness and brevity. Relevance: The paper must contribute to informing the defence and security debate in Australia and/or to bringing an Australian perspective to that debate internationally. Its focus should be on defence and security policy and/or its strategic and operational implementation, although a paper with a different scope (tactics, techniques, equipment and the like) will be considered where it contributes to the overall objective. Military history papers are acceptable where they provide historic context for the current debate or lessons applicable to it. Newness: The paper must make a new contribution of a substantive nature to the current defence and security debate. It must be the author’s original work and must not have been published previously. Soundness: The paper must establish the facts and evidence upon which it is based (citing relevant literature where appropriate); and deductions, inferences and conclusions drawn must flow logically from the evidence. The referee does not have to agree with the deductions and conclusions. It is sufficient that they flow logically from the evidence and are not extrapolations beyond the scope of the evidence. Brevity and Clarity: Space is always at a premium in United Service. We only have 24 'editorial' (i.e. non-advertising) pages per issue. Consequently, we cannot afford to publish long-winded, poorly-written papers. Normally, we restrict papers to a maximum of four journal pages (~ 3400 words or equivalent as illustrations). Where a paper is not written clearly and concisely, its acceptance will be subject to significant amendment. Acceptance: This recommendation is appropriate where the paper’s subject matter is relevant to United Service; the paper presents new evidence and/or ideas; the research underpinning the paper and the ideas presented are sound; and the paper is written clearly and concisely. Acceptance, subject to satisfactory amendment: This recommendation is appropriate where the paper is basically relevant, new and sound, but needs amendment to correct errors identified or to improve the writing style. Rejection: This recommendation is appropriate where the paper is not relevant to United Service; or does not make a substantive new contribution to the literature; or its methodology or reasoning are unsound; or it is long-winded and poorly written, such that reasonable amendment is unlikely to bring the paper up to the standard of clarity and brevity necessary for publication in United Service. A report form which may assist referees to render their report can be DOWNLOADED HERE, although its use is not mandatory.